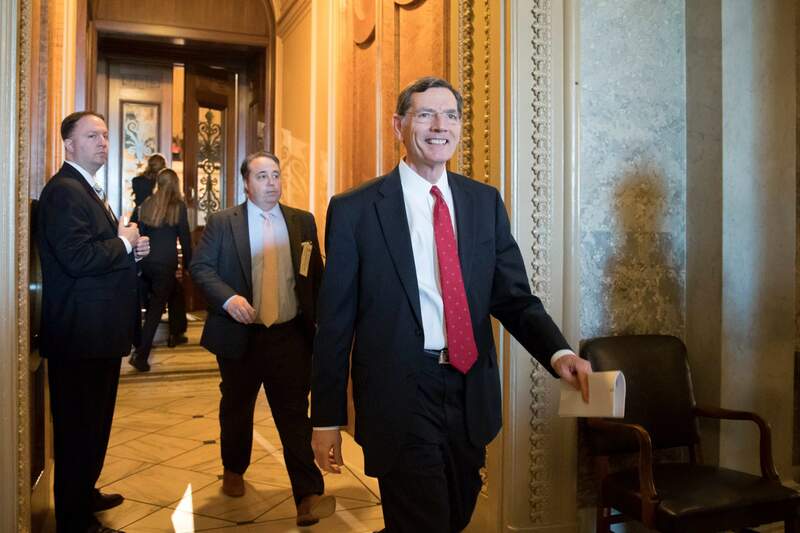 Sen. John Barrasso, R-Wyoming, chairman of the Senate Environment and Public Works Committee, leaves the chamber following a surprising win for environmentalists and Democrats and a blow to the fossil-fuel industry, as the Republican-led Senate failed in a bid to reverse an Obama-era regulation restricting methane emissions that escape from oil and gas wells on federal land. Barrasso was a sponsor of the joint resolution had predicted the rule would be overturned. WASHINGTON, D.C. – Gwen Lachelt may have impacted the votes that defeated the joint resolution to disapprove of the Department of the Interior’s methane rule. On a visit to Washington on Tuesday, the La Plata County commissioner ran into Sen. John McCain, R-Arizona, in an elevator. “By chance, I was able to visit with Sen. McCain for quite some time. I talked to him about why the BLM methane rule is so important to La Plata County. We do not like the black eye of living under the largest methane cloud in North America,” Lachelt said. Prior to that encounter, McCain had committed to voting for the joint resolution. Afterward, McCain changed his vote. “I’ll never know...if our visit made him call Sen. Barrasso last night and (tell him) he was changing his vote,” said Lachelt. The Methane and Waste Prevention Rule is a regulation to limit methane emissions from energy production sites on public lands. The rule aims to minimize wasted natural gas resources on public and tribal lands by requiring companies to look for and repair leaks, minimize burning and prohibit direct venting of gas into the atmosphere. The rule was finalized in November 2016 after three years of public meetings and comments. The joint resolution of disapproval was empowered by the Congressional Review Act (CRA), which allows Congress to review new federal regulations issued by government agencies and pass a joint resolution to overrule them. The Senate voted on Wednesday morning to not proceed to debate and a vote on the joint resolution by a vote of 51-49, with deciding votes cast by McCain, Sen. Susan Collins, R-Maine, and Sen. Lindsey Graham, R-South Carolina. The House approved the joint resolution in February on 221-191 vote, with Rep. Scott Tipton, R-Cortez, voting for disapproval of the rule. In Wednesday’s Senate vote, Sen. Michael Bennet, D-Colorado, cast the final vote in opposition to the resolution. Sen. Cory Gardner, R-Colorado, voted with the majority of his party to proceed to debate and a vote on the joint resolution. “Today is a good day for the pocketbook and health of people in my county, and for all Americans. Thanks to Senators Bennet and McCain, the Interior Department’s rule to cut methane waste and pollution will go into effect, despite the best efforts of the oil and gas lobby to block it,” Lachelt said in a statement. The rule is similar to a law passed in Colorado in 2014, which regulates methane emissions from oil and gas drilling. Colorado was the first state to regulate methane emissions, and the law was passed with the support of Encana, Devon Energy, Anadarko and environmental groups. “Reducing methane emissions is important to protect our environment and Colorado is already leading the way… We’re glad that the BLM is following Colorado’s lead and appears to be using similar strategies,” Bennet said in a statement. Some environmental groups in Colorado advocated for the federal rule, saying Coloradans are affected by methane emissions from other states, even with Colorado’s stricter laws. “Air pollution from the oil and gas industry doesn’t respect state boundaries, leaving western Coloradans breathing toxic pollution from Utah and other states,” Bruce Baizel, program director for Earthworks energy program, said in a statement. The Department of the Interior found that between 2009 and 2015, enough natural gas was lost on public lands to supply about 6.2 million households with energy for one year. Some of that lost gas is excess or dirty natural gas that can’t be sold or transported. A report by the Environmental Defense Fund found that the methane rule could save $330 million worth of natural gas each year. “We must retain these common-sense rules not only for our environment, but also for taxpayers to receive a fair return on oil and gas resources,” Bennet said in a statement. Methane is a greenhouse gas that is used as fuel for electricity generation. Methane can warm the atmosphere at a rate of nearly 30 times that of carbon dioxide, according to the Environmental Protection Agency. “Oil and gas operations across the country threaten clean air and waste taxpayer dollars, sending our precious natural resources up in flames. Clean air and healthy communities shouldn’t be a partisan issue,” Lauren Pagel, policy director for Earthworks, said in a statement. Organizations such as the Western Energy Alliance saw the rule as overreach by the federal government. “Obviously, we’re disappointed the Senate didn’t even have the wherewithal to debate overturning the rule on the floor...Ultimately, it failed because three Republicans and an oil state Democrat were unwilling to constrain federal overreach,” Kathleen Sgamma, president of the Western Energy Alliance, said in a statement. The Congressional Review Act can be used for only the first 60 legislative days of a session of Congress, which expires this Friday. Another motion to proceed to debate and a vote to disapprove the rule could be introduced in the Senate any time before the Senate is out-of-session on Friday. Shira Stein is a reporting intern for the Herald in Washington, D.C., and a student at American University. Reach her at sstein@durangoherald.com and follow her on Twitter @stein_shira.